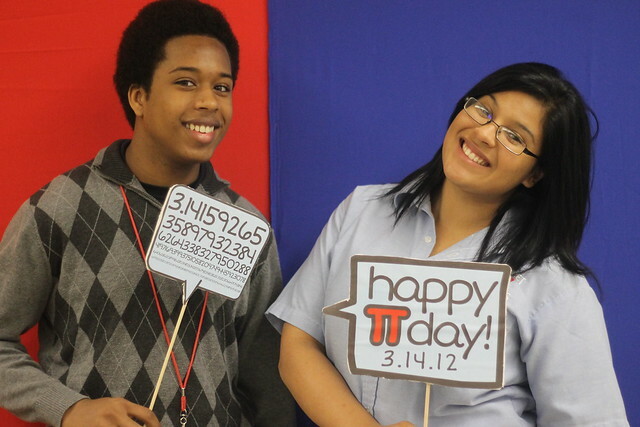 I celebrated Pi Day with my classes yesterday, and we had a ton of fun! I always look forward to Pi Day (March 14th= 3.14= pi) as a time that I can show my students that math can be fun and interesting. This is the 6th year that I’ve thrown a Pi Day party for my math classes, and I can definitely say that it gets better every year! For this year’s Pi Day project, my students created “Fakebook” profiles for individuals who played a role in defining the number pi. Early figures like Ahmes the Scribe from ancient Egypt to modern mathematicians were assigned. The “Fakebook” profile tool was not without its challenges–several students lost their work–but, for a FREE tool, it was great. Students were able to create a full profile with friends, wall posts, biographical info, and more. In true Facebook form, they were even able to add “likes” to their posts! Visit Classtools.net to check out Fakebook, one of several free educational tools offered by this site. Every year, I give the students a “Pi Day Packet” which consists of a brief history of the number pi, its first 1000 digits, Pi Day carols for students to sing, and a “measuring pi” activity sheet for students to complete in class. First, students measure and record the circumference and diameter of several round objects-they usually use the pies they brought for the celebration! Then they add, subtract, multiply and divide the circumferences and diameters. If the measurements were accurate (which is not a given!) students should discover that when they divide the circumference of any circle by its diameter, they get a number that is close to pi. This is a great way to allow students to figure out what pi really means. Thanks, Mrs. Braud! I have some unfinished business to do at Ehret in the fall, so I will see you in August. Keep up the great work in college and have an awesome summer! Previous Previous post: Paper-Folding Fun!